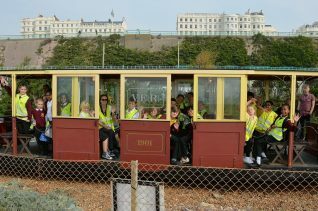 Young engineers from five Brighton & Hove primary schools are busy inventing new forms of transport, to get from Brighton to Rottingdean, inspired by the Brighton based pioneer Magnus Volk. The designs will go on display in Brighton Museum on 22 and 23 November 2014. 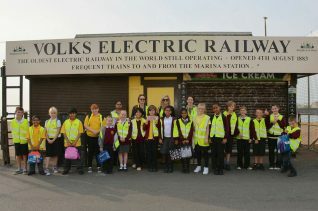 The children are involved in a flagship project led by Heritage Learning Brighton & Hove. 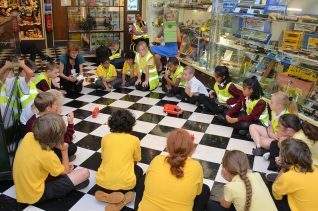 During the project the children will be supported in school by a range of local experts including STEM Sussex and The Keep and the occasional e-mail from ‘Magnus’. 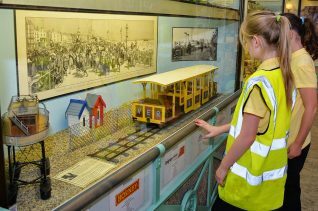 As the photographs show, the children visited the Brighton Toy and Model Museum and the Volk’s Electric Railway to get some ideas for their inventions. The project ends with a Celebratory Day on Friday 21 November. The children will present their models and receive ‘graduation’ certificates from the BBC broadcaster Nicholas Owen and Janita Bagshawe, Director Royal Pavilion & Museums. The models of their weird and wonderful inventions will then go on display in Brighton Museum for one weekend only.